Welcome to Century City Mall – the mall of modern Makati. Located along Kalayaan Ave., Century City, Makati, Century City Mall is a remarkable, world-class shopping and entertainment complex with a vibrant range of shops, services, and restaurants. Clothes, gadgets, books, shoes – you name it, we’ve pretty much got what you’re looking for. In fact, Century City Mall is such a family-oriented space that mom, dad, and the kids can all go off and have a great time and reconvene for food and entertainment without breaking a sweat! A fantastic mix of new and exciting restaurant concepts peppers the mall and provides an array of delightful cuisines. From local favorites to delightful international food brands, Century City Mall offers a unique range of food and beverage options to tantalize both casual diners and seasoned connoisseurs alike. Century City Mall’s cinemas are some of the coziest and most comfortable in town! Its three nifty cinemas are a cinemaphile’s dream. But the Premier Cinema is a jewel above the rest. Featuring high-end brown leather seats and carpet fabrics, fully-digitized projection, top-of-the-range Dolby Atmos 7.1 surround sound, and a direct connection to the cinema lounge – not to mention a massive free bag of popcorn and large drink - the premier cinema is the ultimate movie fanatic haven! Century City Mall is one of the most compact malls in Makati. As such, there was a conscious effort to feature tenants that truly match and cater the lifestyles of Century residents and visitors. This allows for a streamlined and highly-focused customer experience and good differentiation between stores. Century City Mall is a dynamic lifestyle focal point with plenty of natural light and ventilation for optimal comfort. From its generous outdoor spaces that are landscaped and terraced to let you better socialize, seamless free WiFi, to its customer-centric concierge and shuttle service to keep you happy and connected, Century City Mall provides a holistic, elevated, and distinguished customer experience. Century City Mall exemplifies the best in modern retail design and architecture. Its external white color minimizes heat gain to the walls and roof. The facade material (EIFS - Exterior Insulation Finishing System) creates a wall that avoids heat gain to the units, reducing the energy needed for air conditioning. The tinted horizontal glass sheets reflect sunlight and reduce heat transmission to the floors, thereby significantly improving your comfort level. Natural ventilation and vegetation on the roof garden (level 4) help filter the air and reduce local temperature. Natural light filters through all levels via a series of sky lights. Waterless urinals save water consumption. These and others help make Century City Mall not just a pleasant place to dine, shop, and relax, but a destination that respects the environment for the benefit of all in the community. Century City Mall features at least two regular events for your convenience and pleasure. Century City Mall features at least two regular events for your convenience and pleasure. Follow our Facebook page at https://www.facebook.com/CenturyCityMall/ and Instagram page at CenturyMallPH. Join our regular weekend mass at San Padre Pio Da Pietrelcina Chapel at the 5th floor. Mondays to Fridays at 6PM, Saturdays 7PM and Sundays 11AM to and 7PM. Century City Mall is a dynamic new shopping and entertainment complex in the heart of Century City, an exclusive enclave of luxury skyscrapers in Makati, Philippines. Surrounded by some of the most incredible structures in the country, including the Gramercy Residences, the Knightsbridge Residences, Milano Residences, Trump Tower, and Century Spire architecture by Studio Daniel Libeskind and interior design by Armani/Casa, Century City Mall stands in exceptional company. Welcome to our concierge services – the pride of Century City Mall. Our super-friendly, customer-oriented staff exists for one simple purpose: to make your visit to the mall a superior experience. Forgot your wife’s birthday? Looking for an item but need help to find what you’re looking for? Fret not! Call the Century City Mall Concierge and we’ll be happy to shop on your behalf. Just give us the details of the item you need and we’ll arrange the purchase for you. If you’re running low on supplies and pressed for time, call the Century City Mall Concierge Desk and arrange for your groceries be delivered right to you doorsteps*. This time-saving grocery-shopping service is yours for a minimum receipt purchase of Php 1,000. Want to shop but are hampered by too many shopping bags? Want to watch a movie but your groceries are in the way? Allow us to take the load off your hands so you can fully enjoy the mall. Deposit your items with us and pick them up when you’re ready. Or we can deliver them your car, whichever is convenient for you. While it’s easy to get to Century City Mall, sometimes we crave the convenience of being picked up in a spacious, air-conditioned van and being chauffeured to the mall. Well, that nifty convenience is a reality with our shuttle service. 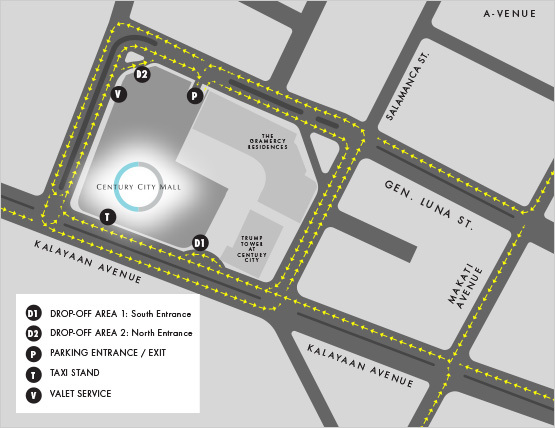 Just give us a call and we’ll send a vehicle to pick you up, as long as you are within the vicinity of the Makati CBD. And don’t worry, this one’s on us each and every time! Shuttle Service is available every Tuesday and Thursday, from 10:30AM to 3:00PM. Celebrating your big day? Treating your officemates to a mid-year-bonus treat? Popping the question to your beautiful, unsuspecting girlfriend? Let us help you make these moments extra special. From conception to inception we’ll help plan, reserve, and deliver all that you need. When we say we’re a Concierge Service, we mean it! For more details on these services, feel free to visit our Concierge Desk at the ground floor of Century City Mall or call 705-6200. It will be our utmost pleasure to serve you. Lights up . . . it’s Christmas! Copyright ©2013 Century Properties Group, Inc.